My sweet T’s birthday cake! For the record, cake is not health food. I get that. Really. But as we prepare for Thanksgiving (not even a month away! ), I’m trying to include as many fresh, local ingredients into our Thanksgiving meal as possible. And for the record, that meal involves cake. And pie. Don’t judge–you know you want cake, too. Or pie. Or maybe both. Here in North Carolina, we produce sweet potatoes. A lot of them. Not only are sweet potatoes naturally sweeter than their other tuber cousins, they are packed with vitamins, fiber and antioxidants. After watching THIS video about sweet potatoes, we typically buy organic sweet potatoes because who wants a “bud nip” cake? Not me. Not even with ice cream. This cake is my “go-to” cake for holiday parties, autumn pot lucks and any time I want to look super fabulous to my family. The sweet potatoes make for a very moist cake. The original recipe is from Southern Living, but I’ve tweaked it a bit over time. I do use whole wheat flour, so my cake doesn’t have a super fine crumb, but it is still tastes great! It is not health food, but it is far better for you than grocery store cakes, which substitute hydrogenated oils and lots of sugar for more expensive (and flavorful) ingredients. They hope you can’t tell the difference, but there is a reason those cakes all taste more or less the same. You can make this cake without the praline glaze, but I highly recommend making the glaze. The cake itself is not very sweet, so the glaze adds a lot without making the cake too sugary. Preheat oven to 350 degrees. Lightly grease and flour a 12 cup Bundt cake pan. Using a standing mixer, beat cream cheese and butter together until creamy. Add eggs, one at a time, beating until just combined. Add sweet potatoes and vanilla and mix well. In a large mixing bowl, combine flour, baking powder, baking soda, salt and spices. Mix well. Gradually add the flour to the wet mixture, beating at low speed (unless you plan on wearing the flour) and mix just to combine. This batter will be very thick! Pour the batter into the greased and floured pan. Bake at 350 degrees for 70 to 75 minutes. Remove cake pan from oven and cool the pan on a wire rack for 10 minutes. Remove the cake from the pan onto the wire rack and cool for 1 hour. When the cake is near the end of its cooling time, make the glaze. Chop the spiced pecans into rough pieces, but not too small. In a heavy saucepan, combine brown sugar, butter and milk and bring to a boil over medium heat. Whisk constantly and boil for one minute. Remove from heat and stir in vanilla. Whisk in powdered sugar, a little at a time and mix with the whisk until smooth. Let sit for 5 minutes, stirring occasionally, until glaze begins to thicken. Pour over cooled cake. 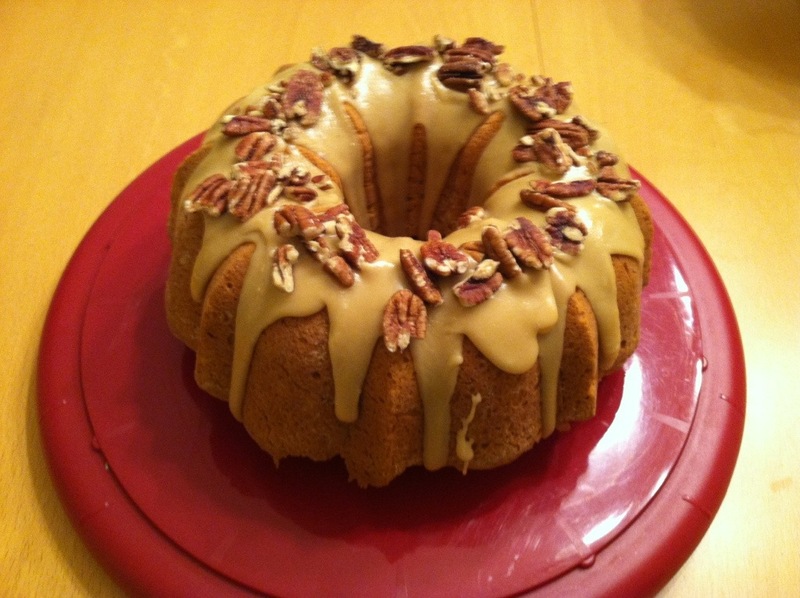 Sprinkle the top of the cake glaze with the spiced pecans.